The series ran for three seasons on Israeli TV, all in Hebrew. Some of the half-hour episodes were divided into video clips and published on YouTube with English subtitles. We found a few new ones and we'll continue to share them with you. 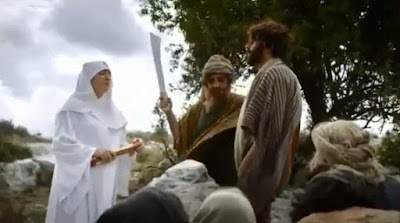 Today we're posting a parody that reimagines the scene after crossing the Jordan river where God tells Joshua to circumcise the second generation of men who left Egypt, where circumcision could not be practiced. so not funny. one of the least popular Israeli programs on TV. Written by secular leftist writers. I think you could have selected something better.